The pace of modern life can make the quest for balance and good health a joyless exercise, wrought with the very anxieties and disappointments we long to alleviate. For the millions of women struggling to make health and self-care a priority, Judy offers readers a refreshing and inspiring take on the true meaning of wellness. 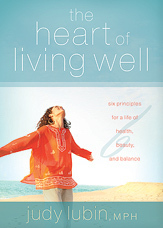 An inspirational blueprint for healthy living, The Heart of Living Well will help you transform your journey to wellness into a spirited path of self-discovery and personal empowerment. Open Your Mind to Wellness. Create space in your mind and your life for positive, lasting change. Find Your Balance. Simplify your life and keep stress at bay while adopting holistic strategies that renew and uplift you. Feed Your Spirit. Enrich yourself through practices and rituals that build your connection to yourself and the world. Open Your Heart. Balance your emotions and live from the heart by following your passions and practicing forgiveness and gratitude. Honor Your Body. Find new joy in exercise, healthy eating and self-care by listening to your body and the natural rhythms of life. Live in Beauty. Reclaim your inner radiance by celebrating the beauty and greatness within and around you. Weaving modern science with timeless principles and practical, down-to-earth solutions, The Heart of Living Well offers powerful yet simple tools and tips for creating a lifestyle that nourishes your mind, body, heart and spirit. Packed with expert advice, touching anecdotes, and personal stories from other women, The Heart of Living Well will help you break through old barriers and inspire you to live your healthiest and fullest life.